Always loved Zanardi, I met him when I was a kid and he's a super nice guy. He's a racer: car or otherwise. So, no surprise here!! Former Williams, Lotus and Jordan Formula 1 driver Alex Zanardi won gold in the 2012 Paralympic handcycling race around Brands Hatch circuit on Wednesday. The 45-year-old was competing 11 years after losing his legs - one at the knee and one above - in a horrific Champ Car crash at the Lausitzring. He previously won silver in the 2011 World Road Para-Cycling Championships, his first medal since moving into the sport following his race-winning spell in the WTCC with BMW. Zanardi faced up against nine other competitors in the 16km H 4 Brands Hatch time trial, and at the halfway mark had assembled a lead of 14 seconds over Germany's Norbert Mosandl. He continued to ease away from the German over the final eight kilometres, eventually winning in a time of 24m50.22s. Mosandl finished second, just over 27 seconds down, with America's Oscar Sanchez a further 18 seconds back in the bronze medal position. I just saw a guy the other day on a hand-cycle. Damn that looks hard! Good article. Apparently, Vasser promised Zanardi a car for the Indy 500 if he won gold. If Vasser comes through on that promise I'd be at the track in a heartbeat. My bro has the 96,97 chip ganassi target team race jacket with Zanardi's and Vassers signatures on it. Van Dyk's shoulder going into the final corner as a peloton of eight riders fought for the best position. his way impressively to the line. trailed home in second place with Wim Decleir from Belgium taking bronze. Zanardi, who won the men's time-trial, has a chance to claim a third gold medal tomorrow in the team relay event. "To win this race in this way, in such a dramatic way and sprinting makes me really proud," said Zanardi. sprinter and just had to be confident in myself. And it worked. tested my opponents and understood my tactic would not work, so I changed it completely and only tried to save, save and save. "I used the uphills as rest, the others were overtaking me, then in the downhills I caught them up and regained my position. "I managed my energies well. It's been a tough race, I could have very well lost it." Former Indy car and Formula 1 star Alex Zanardi will make a full-time return to motorsport as a BMW factory driver in the 2014 Blancpain Sprint Series after a four-year absence. Zanardi, who won two gold medals in hand bike racing at the 2012 London Paralympics, will race a BMW Z4 GT3 for the same ROAL Motorsport (formerly Ravaglia Motorsport) squad with which he contested the European Touring Car Championship in 2004 and the world championship from 2005-09. The two-time CART title winner will drive his V8-powered Z4 alone in the one-hour races of the championship, formerly known as the FIA GT Series, after a rule change last year designed to encourage physically challenged drivers. His BMW will be specially adapted with the hand controls he fine-tuned during his return to racing in touring cars in the wake of the Champ Car accident in which he lost both legs at Lausitz in 2001. Zanardi said he was motivated to make a comeback after testing a DTM BMW M3 at the Nurburgring in November 2012 (BELOW). "When I took to the track in the DTM car at the end of 2012, I immediately got itchy fingers again," he said. "Ever since that moment, I have been toying with the idea of returning to motor racing. Together with BMW, we have looked at various options and I am pleased that it has worked out with my old friends at ROAL Motorsport." BMW Motorsport boss Jens Marquardt added: "I cannot express how delighted I am that one of the greatest heroes in the history of BMW Motorsport is returning to the cockpit of one of our racing cars. From both a human and a sporting aspect, Alex is a role model to all of us." Zanardi's program will encompass six of the seven weekends that make up the Sprint Series, which will leave him time to continue his preparations for a Paralympic return in Rio next year. Racing alone in the series will offer Zanardi no advantage: the driver change element of the mandatory mid-race pit stop is generally completed before all four wheels have been changed. ROAL will field two Z4s in both the Sprint Series and its sister Blancpain Endurance Series. Alex Zanardi says he thought BMW was joking when it offered him the chance to make a one-off DTM appearance at Misano. Zanardi will make his debut in the series in the pair of night races at Misano in August, and BMW has started work on adapting its M4 DTM car to suit the double amputee's needs. DTM rule changes for 2018, which allow a seventh car from each manufacturer to run as a non-points scoring guest entry, have helped facilitate Zanardi's appearance, following Matias Ekstrom's farewell at the Hockenheim season opener. Zanardi says he was approached by BMW's motorsport director Jens Marquardt two months ago. "Jens Marquardt came up with the idea, he offered me the opportunity to be in that role in Misano," he said. "I never expected it to be possible. "At first I thought it was a joke because I know how competitive the DTM is. I haven't driven a race car in a long time. "The last time was in Mugello in 2016 at the Italian GT Championship season finale. "There are still many question marks and it won't be a Sunday afternoon ride for me. "It's going to be one of the biggest challenges I've ever faced as a racer." Wow. 51 years old and starting his first DTM race. Alex Zanardi has been racing BMW race cars since 2003, but this month’s drive at the DTM race weekend in Misano will mark something new: For the first time ever, he will race without his prosthetic legs. To prepare, the 51-year-old is at Vallelunga today and tomorrow for a series of intensive tests with the modified BMW M4 DTM. Zanardi is adjusting to several modifications in the cockpit which will allow him to push the DTM car to its limit without using his prostheses. Zarnardi will have a newly developed hand-operated brake system at his disposal for the first time. This replaces the combination of brake pedal with a permanently attached artificial leg, which Zanardi has used to brake on his previous outings in BMW race cars. The advantage of this new system is that it requires less effort and is thus far easier to operate. The brake lever is located to the driver’s right, in the center console area. The brake lines have been extended and laid from the footwell to this lever. As a result, the pedal box, with the throttle, brake and clutch pedals, is no longer necessary. The footwell in Zanardi’s BMW M4 DTM is empty. The large brake cylinder has been adjusted slightly, meaning Zanardi need not apply quite as much pressure by hand as a regular DTM driver must with his foot to achieve the required braking effect. Where a regular driver must apply 100 to 120 kilograms of pressure (220 to 260 pounds), a maximum 70 kilograms (154 pounds) is sufficient for Zanardi. As well as the size of the brake cylinder, the improved leverage of the handbrake lever also makes the whole braking procedure easier. For the new system to work, the BMW Motorsport engineers turned the operating principle of the brake cylinder on its head. While the brake pedal in a normal BMW M4 DTM exerts tensile force on the brake cylinder, the handbrake lever in Zanardi’s car applies pressure to the cylinder. As with every BMW M4 DTM, Zanardi’s car also has a parking brake, which is used to build up preload pressure to allow the fastest possible start. Like his fellow BMW drivers, Zanardi can operate this parking brake via a button on the steering wheel. However, he can also mechanically activate and release the parking brake via a lever on his handbrake. This also allows him to prevent the car from rolling. In a standard DTM car, the drivers use a hydraulic clutch for the start of the race and for pulling away from the pit lane before the race and following a pit stop. In Zanardi’s car, a fully automatic centrifugal clutch is used instead. This automatically opens and closes at certain engine speeds and is no longer operated by the driver. The respective engine speeds are defined by BMW Motorsport engineers as part of their meticulous set-up work. For Zanardi, the system has the great advantage that he does not need to use one of his hands to operate a clutch lever. Initial tests with the centrifugal clutch have been very positive. Both the pulling away slowly from the garage and the fast getaway at the start or after a pit stop have worked seamlessly. The sprint from 0 to 100 km/h (60mph) is roughly as fast with the centrifugal brake as with the conventional system. In principle, Zanardi can change gears in his BMW M4 DTM via the shift paddles on the steering wheel, just like his fellow drivers. Furthermore, it is no longer necessary to operate a clutch in any modern DTM car. Like all the other drivers, Zanardi uses the shift paddle on the right side of the steering wheel to shift up through the gears. When necessary, he can move down through the gears normally with the respective shift paddle. However, as this procedure is usually associated with a braking maneuver for which the right hand is needed, Zanardi can also downshift using a shift paddle on the end of the brake lever. 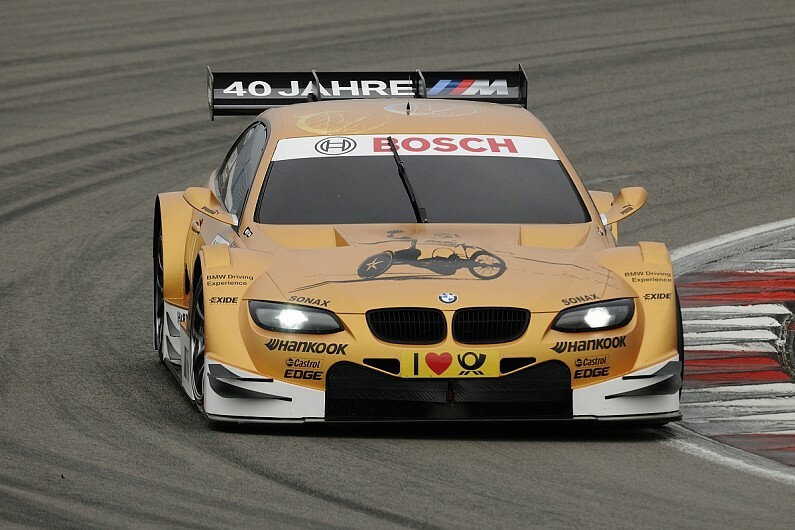 The system, with which Zanardi accelerates in the BMW M4 DTM, was adopted from the GT cars modified for him in the past. He accelerates by using his fingers to pull on a throttle ring on the rear of the steering wheel. The continuous ring can be operated with both hands, or just with the left or right hand. This plays no role in the way the system functions. The throttle ring is controlled using the same sensors as the standard throttle pedal. The steering wheel, including the throttle ring, is basically the same as those used in the GT cars that Zanardi has driven in the past. Only the buttons have been adjusted for his guest appearance in the DTM. For example, a DRS button has been added. Meanwhile, the knobs towards the bottom of the steering wheel, which are used to configure driver aids such as ABS in GT cars, have no function in the BMW M4 DTM. When Alex Zanardi was told he crossed the finish line in fifth place in the second of two DTM guest drives this weekend at Misano, he swore it was a joke. “This the best joke of the weekend… Come on, you’re kidding me. I am an old man, you cannot tease me this way!” he radioed back to his crew. Amazing. What can't Zanardi do? 51 years old, driving a hand operated DTM car and finish in fifth place after just a few tests. Grande! I've seen a really good interview of Vassar and Zanardi recently, and you can tell they are really good friends, joking around and messing with each other. DAYTONA BEACH, Fla. (AP) — Every now and then Alex Zanardi has a chance encounter with someone who reminds him there's never any reason to feel sorry for himself, not that he ever had during his two vastly different lifetimes: the one with legs, and the other as a double-amputee. The man was crying tears of joy. His daughter, born without legs, had been fitted for her first pair of prosthetics that day. When the technician asked for her shoes to set the balance, the father had none. He'd rushed off to purchase his daughter's first pair of shoes and was overcome with emotion by the simple errand. "The next time I found myself alone in front of a mirror I said, 'You never dare complain about what happened to you,'" Zanardi said. Only Zanardi has never complained, not even in the immediate moments after he awoke in a hospital room in Germany without his legs. Both had been severed in a horrific crash during a 2001 race at EuroSpeedway Lausitz, four days after the Sept. 11 attacks, a weekend in which CART was the only U.S.-based sports league to compete as scheduled. Zanardi was a two-time CART champion recently returned from a second stint in F1 and had plowed through the field to lead laps for the first time since he'd left the series after his 1998 title. The crash occurred when Zanardi spun his car after a pit stop and he was hit by another driver. Both legs were severed at impact, blown to pieces and part of a debris field that went as far as the eye could see. "It looked like a bomb blast, I wasn't even sure where the crash scene was and when I got to him, I remember the first thing I said is, 'Where are his legs?'" recalled Dr. Terry Trammell, an orthopedic surgeon and member of the series' renowned safety team. "It was essentially a war injury, one that is not survivable." Blood poured out of Zanardi's body onto the track and Trammell frantically tried to fashion tourniquets. He used Zanardi's firesuit on one leg and a safety crew member handed Trammell his belt for the other. The Italian driver, 34 at the time, went into cardiac arrest on the helicopter ride to Berlin. There he was rushed into surgery and spent days in a medically induced coma before learning the extent of his injuries. "Everybody probably thought when I woke up I was going to ask myself, 'How the hell am I going to live with no legs?'" Zanardi said. "And I simply asked myself, 'How the hell am I going to do all the things I have to do with no legs?'" Now 52, Zanardi has seized every moment in the 17 years since and will cross off yet another remarkable achievement this weekend at Daytona International Raceway when he competes in the prestigious Rolex 24 at Daytona endurance race. He will race for the first time without prosthetics, using a steering wheel designed for him by BMW that allows him to drive with hand levers. Zanardi was an established racing superstar before his accident and his accomplishments since transcend sports. An inspirational figure with indomitable spirit, he designed his own prosthetics — he jokes he made himself taller — and learned to walk again. Then he returned to racing in touring cars. After that came hand cycling, a class victory in the New York City Marathon and four gold medals spanning two Paralympic Games. For good measure, he took up triathlons and in has gone under the 9-hour mark in several Iron Man competitions. Zanardi uses a handbike for the cycling portion and a wheelchair for the running portion. "He's a great champion, a hero, a role model. I mean, where do you stop?" said former teammate and close friend Jimmy Vasser. "The things that he continues to do to show the way how to live your life every day — he probably wasn't here for a minute of this life, but he came back and he just continues to inspire everyone he comes into contact with." Zanardi by nature is both affable and exuberant, and his infectious air of positivity has made him the shining star at an event stacked with some of the biggest names in racing. Almost everyone in the field watched video of Zanardi and his teammates practicing the driver change earlier this month, a choreographed exercise he has perfected. Team RLL can complete the switch, which includes swapping the steering wheel, in less than 15 seconds. "It started at 30-second driver changes and above, then got it down to 14 seconds. It's amazing how he can actually get in quicker in the car than I can," said teammate Jesse Krohn. "He's super positive and never lets things hold him down. He's always finding a way to make things happen. It took time to find a way that suits him. What he can do on track and off track, he doesn't have a disability." The race has become a reunion with old friends and a perpetual meet-and-greet with the upcoming stars of motorsports. Zanardi zips around the paddock on an electric chair and is consistently stopped by racers eager for a minute of his time and a selfie as a souvenir. There are four other drivers in the Rolex field who last shared the track with Zanardi in that race in Germany in 2001. Others have only heard of his feats, both before and after the accident. Zanardi's 1996 pass of Bryan Herta in the corkscrew of the Laguna Seca, California, road course is considered one of the most magnificent in racing history, and he's recognized as the creator of the post-race victory doughnuts most NASCAR drivers do now. British driver Katherine Legge said she's asked for only two autographs in her entire life — Phil Collins as a child, then Zanardi at an industry event several years ago. John Edwards, one of his teammates in this race, received Zanardi's autobiography for Christmas when he was 13. "I think you learn a lot more about life from Alex than you learn about tips and tricks from racing," said Edwards, who is 27. "This guy, in my mind, was a legend and had gone on to do a lot of incredible things. Even after his accident." When Zanardi first entered CART in 1996, as the teammate alongside Vasser at Chip Ganassi Racing, the two became lifelong friends as they won a combined 23 races and three consecutive series championships. Vasser remembered asking Zanardi about his interests and was surprised that "Rocky," about the underdog Italian-American boxer from Philadelphia, was his favorite movie. "That says a lot, though, about his strengths, right? I asked him why because 'Rocky' isn't exactly the deepest movie," Vasser said. "He said, 'No! Rocky was very smart, very clever.' But that says it all, Alex ever since I've known him, he's just never given up. He's an animal, a lion." All the praise for Zanardi has at times embarrassed him over the last month as he's listened to friends share their favorite stories about him. Most are about his humor, or the way he tells a story with intricate details and a touch of exaggeration, and of course, about the way he's inspired each and every one of them. Zanardi, showing a hint of bashfulness, considers every step "another chapter in a fairy tale of a life." "Disabilities are a very relative condition, it is something that defines a situation, but if you can't jump over the problem then you can certainly go around it," Zanardi said. "We all are limited in that none of us can fly and none of us can run faster than some animals, but we figure out a way to go to Tokyo if we have to, right? Or we run faster than an animal with a race car. "Of course I have no legs, which doesn't help, but I'm here and I just try to deliver the best I can." Last edited by Legend2TL; 01-25-2019 at 12:39 PM. I'm so excited for this weekend!!! ...at The Roar he rolled by me in the garages on some electric wheelchair that really scoots!